Online shopping: everyone’s at it; with over 80% of Americans making a purchase within the last month, and 5% on a daily basis, a new era of shopping has begun. American online shoppers spend a whopping average of $1,804 a year! Be it for convenience or the cheaper prices, shopping online certainly has its benefits. You’d think it was mainly millennials making up the majority of online shoppers. But in fact, it is men and women ages 45-54 that drive e-commerce trends, making up a huge 24% of online shoppers. But even Gen Xers are at it. The most popular sites include the mammoth Amazon, eBay, Etsy, Walmart, and Nasty Girl, to name the top few. Everyone is out there looking for the best deals they can get. Here are some sneaky tips on how to find the best online shopping deals and use some cheeky shopping hacks along the way. Don’t Impulse Buy. Let’s say you’ve stopped yourself before clicking “buy now” in your shopping cart. Do you really need that giraffe-shaped knife? Will your significant other appreciate that dashboard bobble head dog, and why-oh-why do you need that many pairs of sneakers? Putting things in your basket for a day or two will give you the time to think about whether you really do need it. Retailers Want to Close the Sale. Retailers hate unclosed sales with a passion, and will do all they can to draw you back in. Many will send you additional offers and coupons if you’re patient enough. Target is one place, for example, that does this a lot. Just make sure to have an account on the shopping site so you can get all the alerts. It’s also a great idea to have a separate email account to use for online shopping alone, so you don’t have to suffer from all the promotions and spam invading your direct account. If you’re not the patient kind and don’t want to fish around for coupons, then simply choose the right day to shop. Sunday afternoon might seem like the most convenient time to laze around the house browsing online…but more than likely everyone else is thinking the same exact thing. Most stores will be rolling out the special offers and discounts during the week, leaving the most expensive prices for the weekend. Sunday Is Best for Airline Tickets. Even though Sunday is the ‘worst’ day to buy retail, it doesn’t mean it’s the worst day for buying other products. A study from Airlines Reporting Corporation (ARC) found that flight tickets for example, are cheaper if purchased on a Sunday, with the following day (Monday) being the most expensive. You may be wondering ‘what is differential pricing?’ Now depending on your geographic location in the US, your device, browsing history, and even your operating system, online sites will often show different prices: this is known as price discrimination. To get the best online shopping offers, you can’t assume that everyone online is always getting the same deal, as this is not always the case. Several companies including Home Depot and Staples have different prices dependent on a host of characteristics of the user. Office Depot admitted to the Wall Street Journal that it uses “customers’ browsing history and geolocation” to change the offers that it displays to visitors. A study by Spanish researchers found that Amazon, Staples, and Steam are among those that vary price by geographic location by as much as 166%! You can’t blame the companies for doing this seeing as they are just going with the WTP price (willingness to pay). If people in richer areas will pay more, then why not squeeze the most they can out of them. There is also hotel price discrimination to take into consideration, as well as the car and flight industries using the same dirty tactics. This is mainly due to the differences in average income dependent on geographic location. In other words, if your zip code area has a high average income, you could well be paying more online. Use a VPN to Beat Price Discrimination. The simple answer to get around price discrimination is to use a VPN. A VPN is a virtual private network, the perfect shopping hack that will effectively hide your geographic location, by hiding your IP address and allowing for private browsing. To get the best online shopping offers, its strong encryption technology will make sure that no third parties can see your online footprint. A good VPN will also make sure to delete your logs, so there is no information related to your browsing history, giving you total online anonymity and the ability to shop online without the bias. Here are three top choices of VPN and a little about each so you can decide which is best for you. ExpressVPN uses the top encryption technology (256-bit AES) to make your browsing experience totally private. It will effectively hide your IP address (think incognito but better) and prides itself in retaining no logs. With over 130 servers to choose from across 94 countries, you can change your location (perhaps to a location where income is lower) to make sure that you get the best deals. Its customer support is available 24/7 and you’ll barely know ExpressVPN is there as it works at such fast speeds in the background. Another way to avoid hotel price discrimination or any form of differential pricing is through the reliable and secure NordVPN. With double 256-bit AES encryption, NordVPN has a whopping 1,374 servers across 61 countries to choose from, so you’ll never be short of choice. It also has the added benefit of being able to connect up to six devices at once, so you can add your Mac, PC, phone and tablet onto one account. Its strict no-logs policy means you’ll be able to shop online without the site knowing your browsing history or location, so you can work your way around geographical pricing and get the best deals on the World Wide Web. SaferVPN prides itself in its speed and simplicity, perfect for those less-tech savvy among us and another VPN great for avoiding differential pricing. Like NordVPN and ExpressVPN, its service includes 256-bit AES encryption to keep its customers secure and anonymous online. With 700 servers in 36 countries, there isn’t quite as much choice as the other two VPNs, but still a sufficient amount to avoid geographical pricing. SaferVPN have admitted to logging session times, but it does not withhold IP addresses nor does it log the sites you visit or any data downloaded. In other words it’s no-logs policy isn’t quite as strong as the other two mentioned here however, it is certainly secure enough for your online needs and perfect for beating the WTP price. Their customer support is fast and effective and includes a live chat should you have any issues. There are plenty of coupon sites such as groupon.com, coupon.com, and retailmenot.com. Signing up to retailer’s mailing lists, you can get coupons delivered straight to your inbox. You might run into the occasional expired codes, but there’s always a coupon deal out there if you’re willing to look for it, and get the best online shopping deals. Use Coupons Wisely. You may have come across many coupons for the same product. Now, not all websites allow for this, but a great shopping hack would be to combine different coupons and promo codes when checking out. To get the best online shopping offers, just make sure that you use them in the right order, that is; say you have a promo code for a 15% discount and another coupon for $5 off. Make sure to apply the 15% coupon code first. This will deduct the 15% from the full price and then you can get the further $5 off – genius! 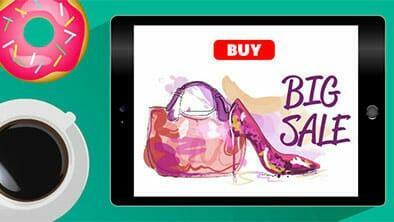 Just like you’d do at the market, to get the best online shopping deals – the same applies. Say you just got your hands on a juicy coupon only to discover it expired a couple of days ago. Chat to customer support and ask if the coupon can be extended explaining that you are hovering over the ‘buy’ button. Sales reps want to close a deal and will more often than not give you a new coupon code or even extend an existing one. We can’t guarantee this’ll work every time, but it’s certainly worth a shot. Get the Best Deals – Combine the Lot! The best trick of all when it comes to how to find the best online shopping deals, is to see just how many of these strategies you can use at once. Always surf with a VPN, then you can add a discount from Groupon, be sure to do your shopping on the right day, and leave it in the checkout basket to simmer for a couple of days as well. A combination means you’ll be getting the best deals out there! Who’s a smart cookie?! Thank you for advice, I used boyfriend NordVPN account login to change my IP address from European to United States. As a result, I found the same COACH handbag at a lower price in the US online store. Can you believe? I saved $80 including shipping cost.